The “Wanderer Fantasy” is the theoretical starting point and crowning work of this recording, which, however, also thoughtfully looks at the atmospherically light side of Romantic wandering. The program thus ﬁrmly leads from the famous wanderer of the educated classes, Felix Mendelssohn, and his journey through Scotland to colorful musical atmospheric images by composers from Liszt to Debussy. They tell of forests, the world of gnomes and sprites, and of fantastical and exotic dances. Venetian gondola songs then segue from dry land onto the water and guide us on the winding bends of the 'Grand Canal' all the way to the 'L'Isle joyeuse', that island of joy regarded as the kingdom of love and bliss. 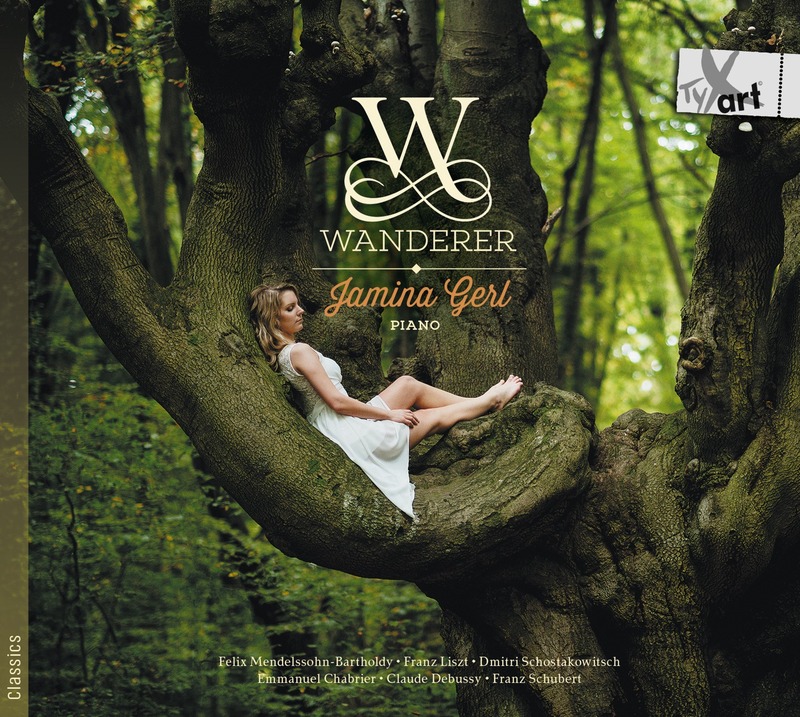 Concerts in Germany and abroad have always earned the young German pianist Jamina Gerl excellent reviews from professional critics. For instance, the press in New York declared her orchestral debut performance of Rachmaninoff's Third Piano Concerto "a triumph for all concerned," christening Gerl "a lioness of the keyboard." In addition to her versatile concert programs, she is often praised for her poetically inspired piano playing, remarkable virtuosity and richly shaded, differentiated expression. Concerts and numerous competition triumphs (e.g. first prize at the 2013 International Shining Stars Rachmaninoff Piano Concerto Competition in New York) resulted in her appearing in such prestigious venues as Carnegie Hall and the Steinway Hall in New York, the Beethoven Haus Chamber Music Hall, the Illsley Ball Nordstrom Recital Hall, Mannes College Concert Hall, Tonhalle Dusseldorf and Munetsugu Hall Nagoya. »... Superbly recorded ... Repertoire choices, too, are wonderful ... a player capable of great pianistc colour ... five stars! FONO FORUM Recommendation of the Month! rbb kulturradio: Radio Broadcast, Artist's Portrait & CD Recommendation! 'Klassik Heute' Recommendation & CD of the Week (Jan 2017)! Interpretation, Sound, Repertoire: 4 Stars - very good! Interpretation, Sound, Repertoire: very good!